Item color Slate blue cont. 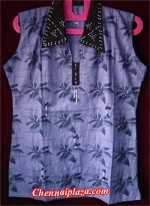 Item Description Fabulous looking slate blue colour Kurti (Tunic) having self floral print that's decorated with sweet looking beads and sequins embroidery work on contrast black colour collar, neck and in buttis all over further complimented by black colour piping in sleeves to make this one a special Tunic. (Available only in 42" - XL Size, extra sleeves provided). 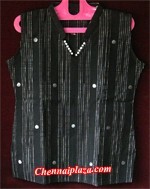 Item Description Beautiful looking black colour Kurti (Tunic) having self stripe designer thread work design and a polka dotl motif thread work on top. (Available only in 38" chest size, 24" length). 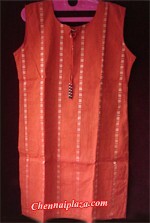 Item Description Lovely looking mustard colour Kurti (Tunic) having self zari stripe designer with a cute lace with beads on neck gives this a cool look. (Available only in 38" chest size, 34" length). 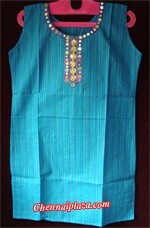 Item Description Smart looking peacock blue colour Kurti (Tunic) having self colourful stripes design enriched by chamki work on neck. (Available only in 36" chest size and 30" length).